« How could I refuse? It occurred to me after walking back to my hotel from a night at Gutshot that one of the major differences between playing poker in London and playing Las Vegas is that in Vegas you will never, ever be walking back to a hotel room that is numbered with a single digit. Yesterday, I was in room 4. I also hit the trifecta – a working TV with all five channels, a kettle and a fridge. Luxury indeed. I was a bit worried about how my luck would hold up, after having to walk from the office in a horrible February drizzle and leaving my umbrella up to dry in the ensuite whilst I went out. Is that unlucky? I really don’t know. I did crash out of the tournament early, and in spectacular fashion. With T6 in the big blind and no raise, I was pretty happy to see a flop of 789, then two players getting their chips in the middle after I checked. However a two pair 78 became a full house on the turn and I was done. This was a freeroll WSOP satellite with £10 rebuys, but I wasn’t particularly bothered about playing in the first place, let alone rebuying. The £25-£50 table I was on had broken up just before it started, when the dealer announced "Right, it’s my last hand, I’m off to play the tournament". We did get our voluntary donation table fees back though. I was back in the action straight away after busting. This table was proper dealer-dealt and I learned that if the dealer wears a Gutshot top, the voluntary contribution is a rake from each pot rather than a time charge. Nobody didn’t volunteer. From next month, there will be a compulsory daily membership fee introduced – £2 from noon to 6pm, £5 from 6pm to close. Not yet sure how this will affect donations, but it’s good to see they have a plan to keep the club running. "What’s that funny looking chip in your stack there?" someone yelled across the table after I took down my first pot. I flipped the El Cortez 50c chip I’d been using as a card protector across to him. A few seconds later it came flying back. "Nice colour", he said, implying "gay colour" I’m sure. It’s pink, what bits of it you can see through the lovely downtown grime. I finished the night up £38 and change after about 5 hours. Gives me a little confidence, considering it was a pretty solid game all night. 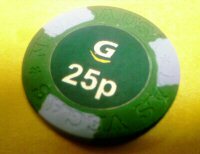 I still have the change in the form of three 25p chips. They have an endeering home made quality to them. Presumably for such a low value chip it wasn’t worth having any specially made (the £1 and higher are Chipco style chips) but the quarters – that sounds so wrong when talking about English money – look like a set off eBay with some custom stickers. The tell tale sign is the "Las Vegas Nevada" edge marking. If I ever get to play poker at the El Cortez with Jackie Gaughan - which might even trump Claire’s game with Oklahoma Johnny last summer - this will be the cheap and nasty chip I use for a card cap.